What is Frankincense Oil & How Do I Use It? If you’ve only heard of frankincense oil in Christmas songs, usually mentioned together with myrrh, you’re not alone. Many people only have a vague idea that frankincense oil might be some sort of spice… but that’s not quite it. As exotic and ancient as frankincense oil sounds, it’s actually a wonderfully beneficial essential oil, still very popular in aromatherapy today. Frankincense oil is beloved for its woodsy, herbal aroma with hints of lemon and pine, as well as its ability to inspire emotional balance and peace of mind. To reap the benefits of frankincense oil you can add it solo to your favorite oil diffuser or blend it with other essential oils to create custom diffuser aromas. Frankincense oil also has a variety of applications in essential oil DIY projects for beauty and around the house. Explore some of the surprising benefits and uses of this frankincense oil to begin incorporating it in your self-care just in time for the holiday season. Plus you can impress your friends and family with some expert knowledge next time you’re listening to Chrstmas carols! What is Frankincense Oil Made From? Frankincense oil is made from the sap of the boswellia tree, native to Arabian peninsula and northeastern Africa. The bark of the boswellia tree is cut open and the sap is allowed to dry and harden into a resin. This resin is then steam-distilled to produce frankincense oil. Interestingly, frankincense is used in all its forms, from sap to oil. The fresh sap is often chewed like gum, and both frankincense resin and oil can be used as an aromatic. In fact, the use of frankincense and frankincense oil goes back thousands of years. One of the most famous mentions of frankincense oil in antiquity is the biblical reference to frankincense that shows up in all those Christmas songs. However, many cultures across the world were using frankincense oil for various ceremonies and other beneficial purposes well before the time of Christian Christmas stories. Since at least 500 B.C. traditional Chinese medicine has included frankincense oil, and Babylonian and Assyrian religious ceremonies may have included burning frankincense oil since around 3000 B.C.E. Ancient Egyptians also very much valued the benefits of frankincense oil. Frankincense resin was charred and ground into powder for eyeliner famously depicted in ancient Egyptian artwork. Frankincense oil was used for everything from its aroma in incense and perfume, to repelling insects and soothing wounds. Frankincense oil was so highly valued in antiquity, it was literally worth more than its weight in gold. Today, frankincense oil isn’t anywhere near as expensive as it was in antiquity, but we think its benefits are just as important as they were way back then. 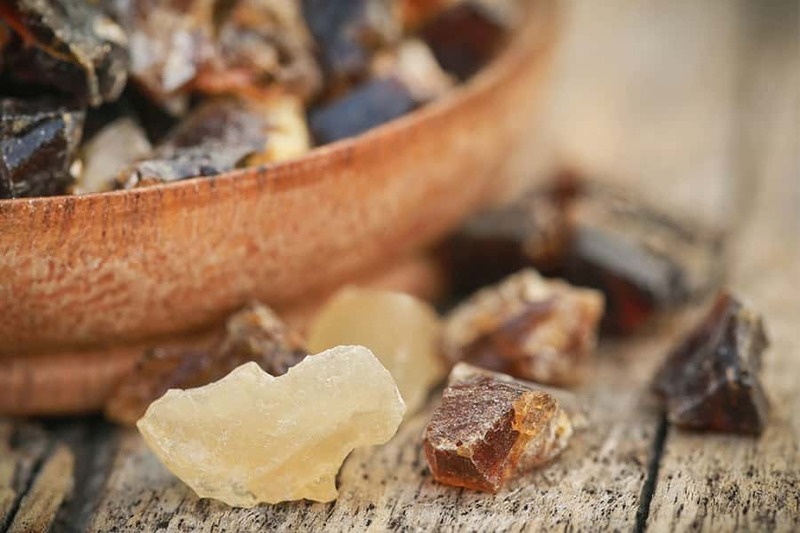 Given its extremely long tradition of use in religious ceremonies, it’s no surprise that Frankincense is often deeply connected with spirituality, mental focus and emotional balance. Frankincense oil is often used by aromatherapists and meditation practitioners to create a sense of peace, spirituality, and center the mind. We will definitely explore the benefits of frankincense that make it so well-suited to the above uses, but there’s even more to explore. Frankincense oil is also beneficial for skin care and household cleaning! The emotionally and mentally soothing quality of frankincense are perhaps most well-known of all frankincense oil benefits. The extraordinary calming effect of frankincense oil is said to allow for deepening one’s connection to their emotions to promote emotional healing and create a sense of balance. Whether you’ve had a poor night’s sleep or you simply have a lot on your mind, mental fatigue can really weigh you down. A quick and easy pick-me-up can be just what you need to turn the day around. One benefit of frankincense oil that often gets overlooked, is that it can be a much needed mental refresh. Diffusing frankincense oil can be especially helpful when you’re fighting mental distraction or feeling overwhelmed. Frankincense oil benefits skin by helping lessen the appearance skin discoloration. Age defying skin care routines can benefit from incorporating frankincense oil to combat issues like scarring, stretch marks, and age spots. Aside from reducing scarring, acne prone skin may also benefit from frankincense oil for its anti-inflammatory properties and ability to reduce surface bacteria. While essential oils should never be applied directly to skin, combining frankincense oil with a carrier oil (like super skin-friendly jojoba) can be a major boost to your complexion. Remember to always do a small patch test to check for allergies and sensitivities before using any new product on your skin. The antimicrobial activity of frankincense oil is a major benefit when it comes to natural cleaning products and natural cleansers for bath and body. Synthetic cleansers can be super harsh, and sometimes even toxic. Making your own natural cleaning products and personal cleansers with frankincense oil is an easy way to cut down on synthetic chemical products. Now that you’re familiar with some of the key benefits of frankincense oil, it’s time to explore how you can begin effectively incorporating it into your life. We’ve compiled a list of some quick and easy ways to start reaping the benefits of frankincense oil. As mentioned above, frankincense oil possesses antimicrobial properties that make it an excellent choice for household cleaning. Make your own natural cleaning spray using frankincense oil by combining the ingredients below. *If you’re making enough frankincense oil cleaner for more than one use, it’s important to use a dark glass bottle to preserve the effectiveness of the mix. Essential oils can be degraded by exposure to sunlight and heat. 1) Add frankincense oil and other ingredients to spray bottle. 2) Cap tightly and shake well to ensure all ingredients are thoroughly mixed prior to use. 3) Can be used on most hard surfaces. Test spot before using if you’re unsure. 4) To use, spray on bacteria-exposed surfaces such as kitchen countertops, bathroom surfaces, and doorknobs. Let sit 1-2 minutes and wipe clean. To reap the skin care benefits of frankincense oil, try this homemade sugar scrub recipe. 1) In mixing bowl, combine frankincense oil and other ingredients. Stir until fulling mixed together. 2) To use, gently massage the frankincense oil scrub into your skin. Let sit for several minutes, rinse with warm water. 3) Store remaining mix in mason jar, keep in a cool dark place. Because it is so mentally and emotionally soothing, frankincense oil is a fantastic essential oil to diffuse when your mood needs improvement. You can diffuse it to help yourself relax at work, or calm down after a really overwhelming day. You can even use frankincense oil while grieving to help yourself find peace. When you’re feeling down, struggling with emotions, or stuck in a brain fog, try one of these frankincense oil blends in your diffuser.